A recent article in the July 2014 Ensign magazine titled “Becoming Perfect in Christ,” written by Seventy Gerrit W. Gong, caught my eye. I’m not one to make many predictions, but when I saw the title, my immediate response was that this article would teach that “becoming perfect” is not what Mormonism teaches. In effect, I thought this general authority would do his best to make Mormonism look like the forgiving faith it really is not. “Perfection is a word that causes different reactions from many people. Some people say, ‘Perfection? Why, that is impossible!’ Others say, ‘Perfection? I get discouraged just thinking about it!’ Yet, would the Lord give us a commandment that was impossible for us to keep? And when He gives a commandment, doesn’t he, as Nephi said, prepare a way for us to accomplish what he commands? The Sermon on the Mount is the Lord’s blueprint for perfection” (The Life and Teachings of Jesus and His Apostles, 1979, p. 57). “Jesus said, ‘Be ye therefore perfect, even as your Father which is in heaven is perfect’ (Matthew 5:48). Because it is very difficult to become perfect, our Father helps us. He has established the Church; called leaders; and given us commandments, principles, and ordinances. In our Church meetings we receive instructions concerning these things. We must obey and live according to God’s laws to become perfect.” (The Latter-day Saint Woman Part A, p. 122). “His example of unhesitating, unswerving obedience sets a very high bar, but when we accept His admonition to ‘be perfect even as I, or your Father is perfect’ (3 Nephi 12:48) as a key element of the plan of eternal progression, we begin to understand what the Lord expects us to be. As we seek to determine what kind of Saints we really are, we must honestly grade ourselves on our willingness to obey God” (Robert C. Oaks, “Stand and Be Judged for What We Really Are,” Ensign, April 2003, p. 65). “If the Latter-day Saints live their religion, they will forsake iniquity and overcome the evil that the enemy of all righteousness causes to rise within them, until every passion and appetite is as perfectly under their own control as a patient animal they hold by the bit” (President Brigham Young, September 2, 1860, Journal of Discourses 8:160). “Every principle of the gospel has been revealed to us for our individual advancement and for our individual perfection, but it is the business of the devil to blind men’s eyes to these facts” (President Heber J. Grant, March 17, 1904, The Latter-day Saints’ Millennial Star 66:168). “Be perfect here? Yes, it is man’s privilege, the Latter-day Saints believe, to be as perfect in his sphere as God our eternal Father is in his sphere, or as Jesus in his sphere, or as the angels in their spheres. Said Jesus to his disciples —‘Be ye perfect even as your Father in heaven is perfect.’ Perfection, then, is to a certain extent possible on earth for those who will live, lives that are agreeable to the mind and will of God” (Apostle George Q. Cannon, October 8, 1874, Journal of Discourses 17:231). “These declarations of the Master are known in the literature of the Christians world as the Beatitudes and have been referred to by Bible commentators as the preparation necessary for entrance into the kingdom of Heaven. For the purposes of this discussion may I speak of them as something more than that as they are applied to you and me. They embody in fact THE CONSTITUTION FOR A PERFECT LIFE” (President Harold B. Lee, The Life and Teachings of Jesus and His Apostles manual, 1979, p. 60). “It is my duty, it is yours, to be better today than I was yesterday, and for you to be better today than you were yesterday, and better tomorrow than you were today. Why? Because we are on that road, if we are keeping the commandments of the Lord, we are on that road to perfection, and that can only come through obedience and the desire in our hearts to overcome the world” (President Joseph Fielding Smith, Doctrines of Salvation 2:18-19. See also The Life and Teachings of Jesus and His Apostles manual, 1979, p. 292). We’ll finish Gong’s article and provide additional quotes in the next blog posting on Thursday. This entry was posted in Authority and Doctrine, Salvation, Worthiness and tagged Church of Jesus Christ of Latter-day Saints, Eternal progression, Impossible Gospel, LDS Church, Mormon Church, Mormon Church Manuals, Mormonism, Obedience, Perfection. Bookmark the permalink. It would be interesting to have some historical context for LDS perfectionism. Joseph Smith grew-up in an era of revival so much so that the area in which he lived was called the “burnt over” area. That was because they had had so many revivals. This was an enlightenment period and was driven to a great extent by the Methodists. It was also the era of Charles Finney the great evangelist. LDS folks get all tear jerky over the prophets past and present and see them as icons of perfectionism and holiness. I think that for Joseph Smith in particular, it was a case of do as I say not as I do. Yet the LDS folks have bought into the Smith fantasy regarding his stellar character. For me I know God sees me as perfect because of my faith in what Christ did for me. As a result I walk by the Spirit not by the flesh knowing that the blood of Jesus continually cleanses me from all unrighteousness. The key to holy living is a deeply personal relationship with God through Jesus Christ Our Lord. I don’t try not to sin because it’s a futile exercise. What I do is focus on Jesus and there by allowing the Spirit to transform me. This results in the Fruit of the Spirit being manifested. Kind of an interesting article in that one characteristics of LDS folks is that they are so up-tight trying to be perfect. LDS women especially suffer with this. And the reason for Mormons focusing on “perfection” is because they have to do enough to become gods. Consider this from an article related to LDS women suffering from depression. LDS women in Utah are at risk for depression due to “toxic perfectionism” and a host of other cultural factors, according to a recent study presented at Utah Valley University Thursday. UVU professor Kris Doty said she conducted a “qualitative exploratory study” by repeatedly interviewing 20 women over a one-year period. The women were diagnosed as depressed, signed up for the study and identified themselves as active members of The Church of Jesus Christ of Latter-day Saints. In her findings, Doty identified five major factors that she said led to depression among the study’s participants — genetics, history of abuse, family relationships, feeling judged by others and toxic perfectionism. Doty said the church’s teachings on striving for perfection led to misinterpretations and contributed to feelings of inadequacy. 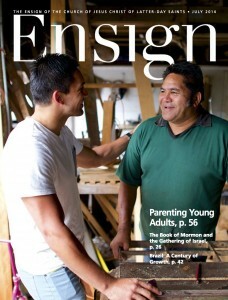 Is the Ensign article going to have any real effect on the Mormon people and their striving for perfection? I doubt it. It’s how cults control people by keeping them down. They are kept on pins and needles never knowing if they’re good enough. It’s a form of spiritual abuse! every day life , this can be spiritually/ emotionally damaging . Rom 5:1 ; 8: 1-4 . Mr Gong is trying to do damage control . Think about this. What is the LDS motive for godly living? As a Christian, my motive for godly living is to please God and bring honor and glory to Him. For an LDS Mormon, godly living is for the ultimate prize of becoming a god. In very legalistic, rules and regulations type religions, the result is not what is hoped for. what the New Testament really teaches about receiving salvation ( eternal life ) . “Again, verily, I say unto you, the most important business of the church, and the most difficult cases of the church, inasmuch as there is not satisfaction upon the decision of the bishop or judges, it shall be handed over and carried up unto the council of the church, before the Presidency of the High Priesthood…“And after this decision it shall be had in remembrance no more before the Lord; for this is the highest council of the church of God, and a final decision upon controversies in spiritual matters” (D&C 107:78–80; emphasis added). “Who is entitled to interpret the doctrine of the Church … ? I am sure that upon serious reflection there is no real difference of opinion on this question among the members. It is so well established by the revelations which we have received and the practice of the Church that the President and his Counselors are invested with this authority that I cannot believe any member will seriously dispute it. In the language of the revelation they, the Presidency, are constituted ‘a quorum … to receive the oracles for the whole Church” [D&C 124:126]. They are the supreme court here on earth in the interpretation of God’s law. The bolded quotes are bolded by lds, whereas italics are mine. It seems that the article in its truest sense can only ‘inspire’ the LDS, because if there are matters of spiritual importance, doctrine only can be dictated by the First Presidency. I think as far as Eric’s article, it’s great to point out that it appears the LDS church is trying to soften the requirements of the impossible gospel. Yet, there’s clear indication in terms (from the link above – “The Authority of the First Presidency” that the article cannot be held as doctrine if there’s contradiction from First Presidency sources (e.g. Spencer Kimball’s Miracle of Forgiveness, Faith that Precedes a Miracle, Gospel Principles, etc). Actually the source that you quote is not an official Holiness source; even though I myself am not a member of the Holiness group of churches, after reading that article from the historical society, I believe they have caricaturized beliefs from the Holiness Movement. And by this I mean not accurately representing the soteriology of that group. E.g. The Wesleyan Church which today is one of the larger derivatives of the Holiness Movement nowhere states or believes that “full salvation” is only accessible after a second step. Even though I’m also not a member of the Wesleyan Church, I believe that their beliefs follow the Scriptures in a non-works based soteriology. So falcon, I suggest that you quote from official sources of the denominations of the Holiness Movement, if you want to properly represent their views. Feel free to correct me if I’m wrong, by using official sources. Here’s another source that gives some historical context to the use of the term “full salvation”. It may be word play or opinion but I don’t know who is the “official” source for defining the term “salvation” within the broad context of the holiness movement use of the term “full salvation” or “fully sanctified”. Anyway, you may want to check a few other sources in the future since the term “full salvation” or “fully sanctified” appears to be fairly common within those groups that might be seen as coming under the umbrella of the holiness movement. ………………..so my point was/is that we know that Joseph Smith in founding his religion borrowed from several different sources. Actually he did this on an on-going basis. He was influenced by the revival movement that took place in his era and area. Grant Palmer points to the four preachers in the BoM as quintessential Methodist camp preachers. The article of this thread in the Ensign discusses “perfection” and the pressure it places on LDS folks. My guess is that the basis of LDS perfectionism comes from one of Joseph Smith’s many borrowed sources quite possibly the Holiness Movement. Perhaps the Word of Wisdom would be evidence of this type of thinking. I’ve heard that it takes something like five miles to turn an aircraft carrier around. Perfectionism is an integral part of the LDS culture. 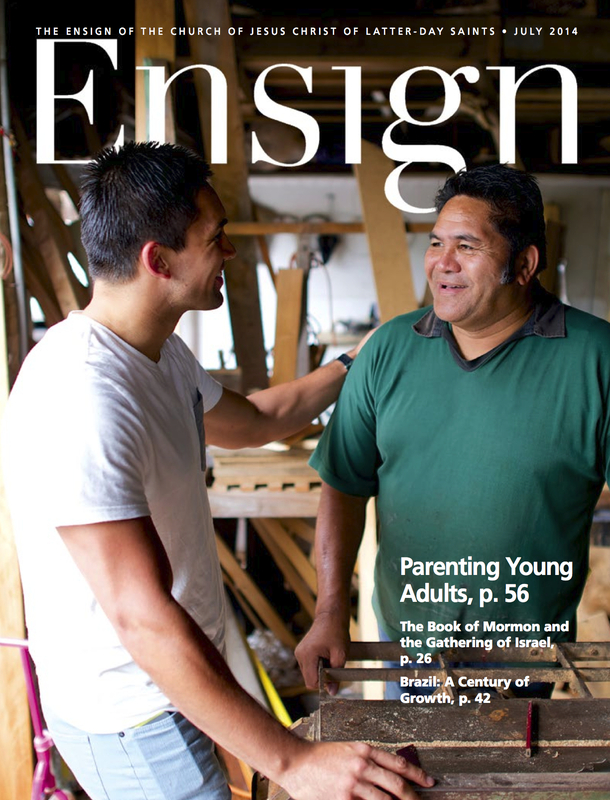 I would submit that it would take more than one article in the Ensign magazine to have a significant change in the Mormon culture regarding the need to be perfect in order to achieve deity status. Your official sources (From the denominations that subscribe to that belief) still do not discuss ‘full salvation’. For example, a quote including ‘full salvation’ from the CMA official website (Christian Missionary Alliance) or handbook of beliefs would be official. They do however, discuss a second experience after conversion. I absolutely agree that most likely JS, Jr. obtained his ideas through the revivalist sentiments around him. You’re absolutely correct. For example the Word of Wisdom was taken, I believe from the temperance movement. And Sharon writes a strong, well resourced article about this. You’re right about the aircraft carrier, falcon. Perfection, that is perfect cleanliness from all sin is needed by a Latter-day Saint to qualify for Celestial Glory. This LDS article is a vain attempt to soften the requirements of Celestial Glory. I don’t know how many people join the LDS church knowing that perfectionist living is a requirement for becoming a god. First of all, I doubt if many converts know about the man to deity program. If a group can keep the faithful followers always in doubt as to if they’ve done enough to earn the big pay-off, they can control them. We know that if an LDS person drinks coffee they can’t become a god. This is because unless the Word of Wisdom is kept perfectly, a member can’t get a temple recommend. No temple recommend, no opportunity to do the works necessary to become a god. you said , ” This LDS article is a vain attempt to soften the requirements of Celestial Glory ” . tried to paint a picture that showcased the Word of Wisdom as a actual revelation from God . more readily and further convince them that he was ” the living prophet ” in their eyes . Sorry folks, I made a mistake again in formatting. In my post above – from “You’ll note the following” to “God’s law” is a quote from lds.org and the source of that link available in the link above “The Authority of the First Presidency”. Because of the way I formatted it, some may think I actually believe it, rather than using it to prove a point. Hope this clarifies. The perfectionist requirement within the LDS church, with its “after all you can do” motto would seem to make it possible for the “perfect” LDS member to become a god by doing all they can do. They wouldn’t need the Mormon god to cover the short fall if they didn’t make the grade. So if they do believe that it can be done without the Mormon god’s help, it really depends on their own ability to complete the task the Mormon system sets out. Some must do it because we know there is a super secret LDS ceremony that deems certain members of having done enough. My point is, these lucky stiffs didn’t need the Mormon god to step in because they obviously had done enough on their own. These members are basically declared gods in waiting. The pressure is off. So I’m wondering what would be the reaction of someone who has been deemed to have done enough to merit eternal exhalation in the Celestial Kingdom while still living? Would it humble such a recipient? Would it in time lead to pride? Would it cause the person to relax or re-double their efforts? One thing that I’m quite sure of is that a person receiving such a designation, receives it mainly on how they have served the LDS church/system. This is a merit badge of the highest order within the troop. A person wouldn’t get the award unless they’ve done a ton of work for the Morg. I don’t know if there’s many “Mother Theresa” types that get this brass ring. Merely living a moral life and doing a lot of charitable work, while probably helping a person’s cause, wouldn’t be enough. The system must be served! of church service can receive — recipients are assured exaltation . I think grindael once posted some pertinent information about this ordinance . The LDS Mormon sect is basically a religion for people who want to join a club. There are a lot of requirements to be in this religious fraternal lodge. I think that’s why the retention rate, especially for converts, is so low. Once the bloom comes off the rose, all these folks are left with is a high commitment organization that demands total loyalty and devotion.